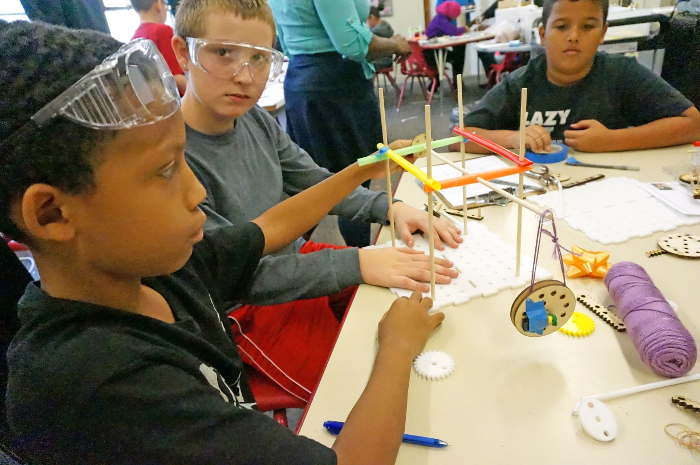 The Kinetic Sculpture/Simple Machines has been a project-based collaboration between the 5th grade classroom teachers, the art teacher, the Library/Media Specialist and the technology teacher. The project began by the classroom teacher introducing the concept of simple machines during homeroom science blocks. Students documented and explained every day simple machines found in the kitchen: a can opener, knife, pizza cutter, etc. Teachers also set up an engineer “gallery walk” where students walked around the school makerspace and read about over 20 types of engineers. They were then tasked with finding two types of engineering they were interested in and explaining their interest.